Contains 500mg of Hemp CBD per 2oz jar. Nourishing combination of cocoa butter, coconut oil and Vitamin E.
Protect your body while helping to heal and nurture your skin. 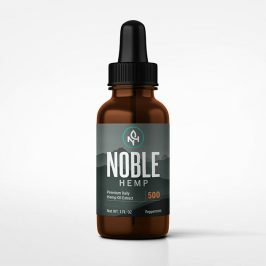 Our Noble Hemp Daily Relief Balm is created from organically grown Hemp plants in Colorado, USA and is Supercritical CO2 extracted. This extraction process allows our products to maintain all of the health-supporting compounds of the original plant resulting in some of the purest extracts on the market. Adults apply to affected area no more than 3-4 times daily. Until you know how this product will effects you, apply and wait a minimum of 3 hours before applying more. Not to be used during pregnancy or lactation. If you have a medical condition or take medication, please consult your physician before use. Keep out of reach of children.